Since we started weaning 5 months ago, the one thing I was adamant about was that I wanted to make sure the little man’s diet was better than ours! We LOVE crisps in our household, a bit too much! But, I don’t want him growing up the same way. However, when we eat lunch together and have sandwiches, it’s nice for him to have something that is healthy, but similar to what we are eating. Step forward Organix, and their brilliant range of snacks. And even better, is knowing they have a “Great Taste, No Junk” promise, which is what every parent wants to hear. 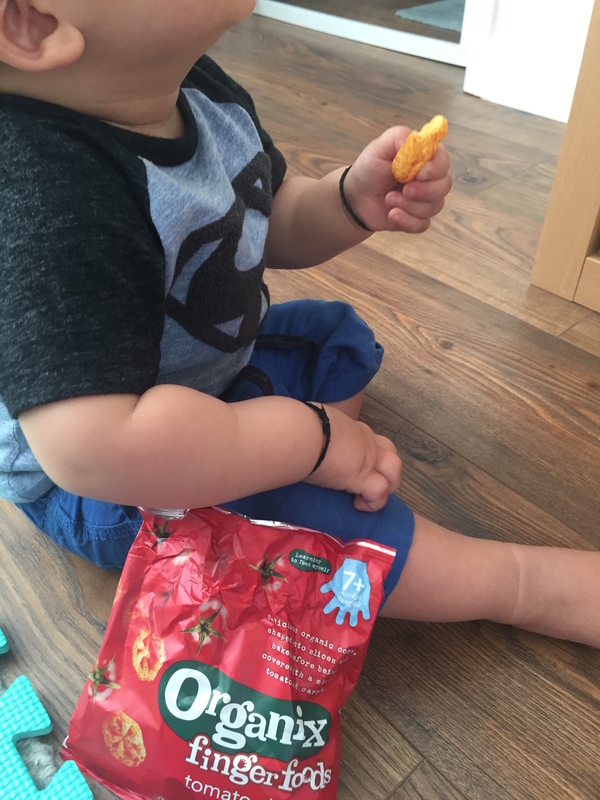 We have tried lots of their products, and they have been an absolute hit with the little man – I think it’s the crunch that he loves! Especially in combination with a soft sandwich. I find that offering foods with different textures together works a treat. 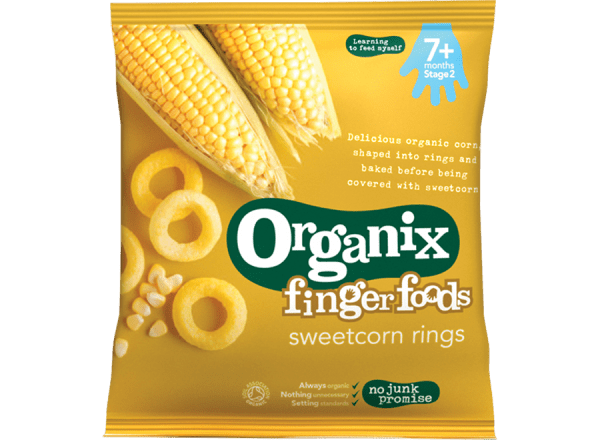 Here are some of our favourites………..
Sweetcorn rings were the first snacks that I gave the him at 7 months. I had checked the ingredients, and was happy at the small ingredients list which was no nonsense (and not full of junk)! They were a hit! He loved being able to hold them and bite off small chunks at a time. I have to admit, I was really impressed with them too (and may have eaten a few)! Firstly, let’s talk about this packaging, and shape – I love it! My worry with these initially were that they were red, and therefore everything that he would touch would turn red! I was pleasantly surprised that this didn’t happen at all! I loved the taste of these as well (I know, I know – it’s not about me) . 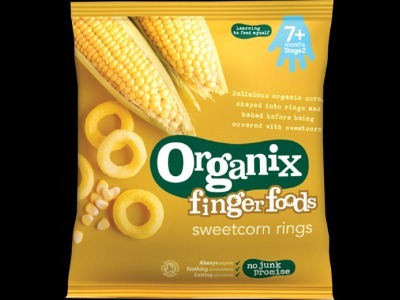 They were also softer than the sweetcorn rings, so yet again another texture to try. They were harder to hold and break initially for the little man, but as his pincer grip improved, so did the way he was able to hold on to them and bite a bit off at the same time. Once again, I was very impressed with the ingredients. When my husband first saw these his reaction was “eugh”! I was also a bit sceptical. Snacks that look like tomatoes? What are they going to taste like?! But, I was very pleasantly surprised! They were totally yummy and reminded me of some of my favourite crisps from childhood – Tangy Toms! I couldn’t believe how similar they tasted, and just how many ingredients Tangy Toms contain in comparison to these! Additionally, they are really easy for the little man to hold and break bits off without making mess! Bonus! He loves them with a sandwich, with the only flip side being that sometimes he doesn’t want his sandwich so I have to hide them! Rice cakes are a great snack to offer outside of meal times. I have found that they are my saviour when it comes to long car journeys or long walks when boredom kicks in, or meals are delayed. 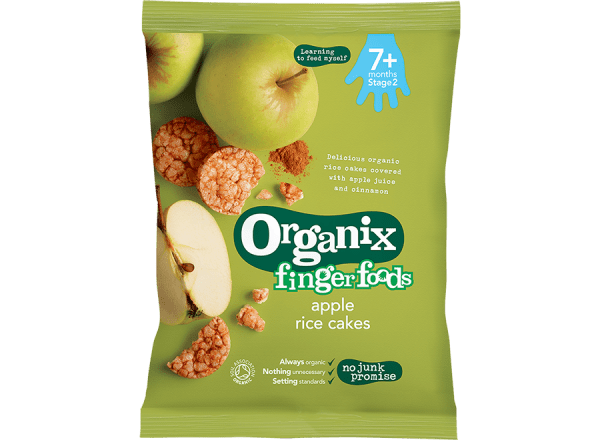 These apple rice cakes are a great consistency, and don’t make any mess / crumbs when broken up (which is ideal for car seats / pushchairs). And the little man is safe with these, as I won’t be pinching them! I just can’t get my head around sweet rice cakes. But, thankfully they’re not for me, and he loves them! And once again – minimal ingredients. 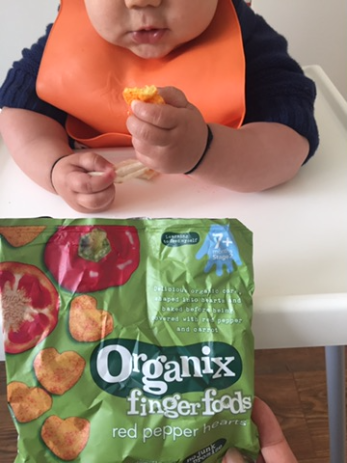 So, there you go, healthy crisp like snacks do exist for babies………(and adults)! Time to go and raid his snack cupboard……..i’m peckish. I was sent some of the above items for the purpose of this review, however all opinions are my own. ← Nursery – is it really that bad? !